Antarctic History – Operation Highjump – Satellite Evidence of Secret Nazi Bases? Operation Highjump was a military mission led by American forces, captained by Admiral Richard E. Byrd. It consisted of 5000 men, quite a large force for what was said “scientific” mission. Upon getting to Antarctica, they were attacked by an unknown force, causing them to retreat to South America, to which Byrd stated “this enemy has technology can by from pole to pole at incredible speed”. What did they encounter there? David Wilcock: All right, welcome to “Cosmic Disclosure”. I’m your host, David Wilcock. I’m here with Corey Goode, and our special guest this week is Dr. Michael Salla from the Exopolitics Institute. We’re going to have a lot of fun with this. We’re going to get into William Tompkins and some of the amazing research that Michael Salla has done in validating even further some of the claims that might seem pretty outrageous that we’ve been discussing on this show. David: Dr. Salla, welcome to the show. Dr. Michael Salla: Thank you, David. David: Your site is called “Exopolitics”, so it sounds kind of self-explanatory, but I’d like you to just start by defining what you consider exopolitics to be. Michael: Oh, sure. Well, I was teaching international politics at American University in Washington, D.C. when I first came across this information about extraterrestrial life and repressed technologies. (Jordan Sather) In late 1946, Admiral Richard E. Byrd led troops from the U.S., Britain and Australia on a mission to Antarctica called “Operation Highjump“. This mission involved 4700 soldiers, 13 ships, and 33 aircraft in what was officially called a research expedition. The part of the story that is seldom told outside of official circles is what Byrd encountered there. While conventional knowledge of World War II states that Germany was defeated in Europe, which is true, little is often said about the Nazi escape South to their bases in Antarctica. While the Allied powers won World War II on the ground in Europe due to their industrial might, the Nazi’s had far more advanced technology, and many members of Hitler’s regime reportedly fled to the icy continent after the war. 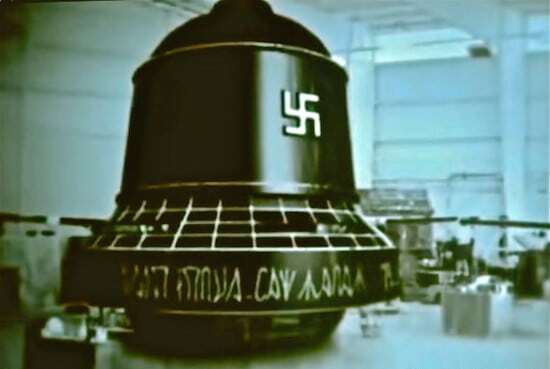 German secret societies, such as the Thule and Vril, are believed to already have had access to electrogravitic, or antigravity, technologies, and had created what is known as the “Bell craft”, named after it’s bell like shape. These craft, with their advanced propulsion systems, are thought to have been effective in neutralizing the 13 ship battle group. In the years after World War II, many Nazi scientists immigrated into America to work within the medicine, aerospace, and intelligence corporations. This situation makes one wonder if American hands were essentially forced to accept these refugees. The world then entered the Cold War years, but the mystery surrounding Antarctica persists.